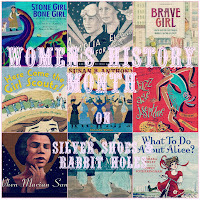 I hope my readers have been enjoying my Women's History Month picture book posts! The comments have been light, so I don't know. If you're sick of them, well, March is almost over, and I want to get on to Easter stuff. This is the last one. Promise. Cross my heart. 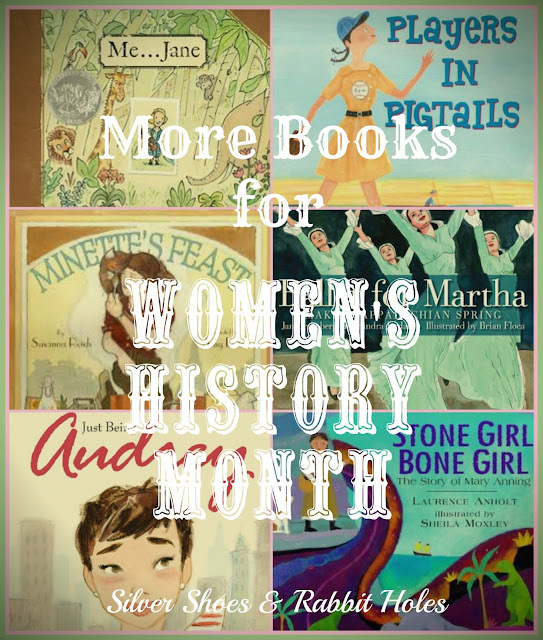 If you're just joining us, March is Women's History Month, and in celebration, my daughters and I have been reading picture book biographies of famous women. If you're interested in seeing what other books we have read, click here! Me... Jane by Patrick McDonnell. Patrick McDonnell, awesome illustrator and picture book maker extraordinaire, depicts Jane Goodall as a little girl, studying the animals around her with her stuffed chimpanzee Jubilee. Jane decides she wants to live in Africa and study chimps as a grown-up. On the last page, we see a photograph of the real Jane in Africa with a baby chimp. Both McDonnell and Goodall provide afterwords in the book, telling children how they can be involved in wildlife conservation. Mary Anning was only twelve years old when she supposedly discovered the first ichthyosaur skeleton in the Jurassic fossil beds at Lyme Regis in Dorset, England. (Name recognition: my girls were excited about this one, because Mary Anning and her discovery figure into the third Ivy & Bean book, Ivy & Bean Break the Fossil Record.) The book delves into common folklore surrounding Mary - she survived being struck by lightning as a baby - and a mystical bit about her dog, which I haven't seen referenced before. (Mary Anning did have a dog, who helped her dig for fossils, but whereas the dog in this book mysteriously vanishes after the ichthyosaur fossil is found, in real life, it seems he was killed by a landslide.) 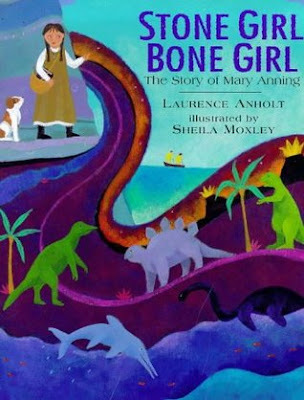 For more about Mary Anning and her life and work (including some myth debunking), see this interesting article at Strange Science.net. A clip from the IMAX film Sea Rex 3D. This is an ichthyosaur skeleton. by Jan Greenburg & Sandra Jordan, illustrated by Brian Floca. 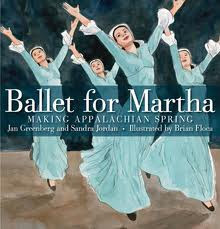 This book is fabulous if you have a little dancer in your life. It serves as an introduction to Martha Graham, modern dance, and the components in creating a ballet - in this case, the choreographer, the composer, and the set designer. We read about Martha's story idea for a modern dance ballet, how she worked with Aaron Copland to create the music for what would become "Appalachian Spring" [working title: "Ballet for Martha"], and her work with artist Isamu Noguchi on designing the spare, distinctive set. Audrey Hepburn remains an icon twenty years after her death. Cardillo and Denos show Audrey as a young girl, longing to grow up to be a ballerina. During WWII, her family rushed to Holland for safety, only to see it invaded by the Nazis. The family was forced to hide with 40 other people in a small house in the countryside, where Audrey suffered from hunger. After the liberation of Holland, she and her mother moved to London, where Audrey may not have had much money, but she knew many ways to tie her one scarf! She could create a new outfit each day! Audrey's dreams of becoming a ballerina were dashed - she was simply too tall and not the right type - so she set about becoming an actress. The book skips to her momentous meeting with the French writer Colette, after which Audrey is cast as the title role in the Broadway play Gigi. From there, she is cast in her first Hollywood film, Roman Holiday, for which she earned an Academy Award. 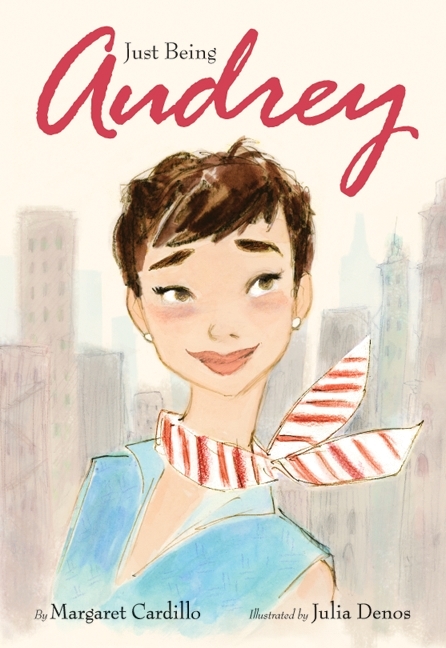 The book showcases Audrey's style, and how different and original she was compared to the curvaceous actresses popular in Hollywood at the time, stressing how she was "just being Audrey." We see a nice spread of Audrey costumed for some of her most popular films, but we learn her favorite role was as mother to her two sons, and as a goodwill ambassador for UNICEF. Please see the official Audrey Hepburn website for more. Proceeds from the website benefit the Audrey Hepburn Children's Fund. Book trailer for Just Being Audrey. Trailer for 1957's Funny Face. by Rebecca Gibbon. Scholastic Press, 2003. 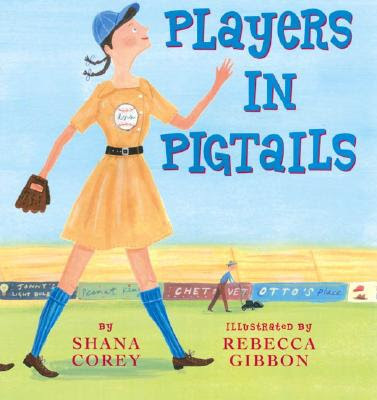 Book trailer for Players in Pigtails. Trailer for A League of Their Own (1992). This is one of two children's picture books about Julia Child to be released in recent years, and it was the other book I was looking for when I checked the library. That one, which I would still love to see, was not available in our city's library system, but this book was. Coincidentally, I had just given the adult book Julia's Cats to my grandmother for Christmas, so my original idea was to have her read this one with the girls. Now two months after I checked it out (and renewed it, twice - it's due back TODAY! ), we have added it to our list of books read for Women's History Month. 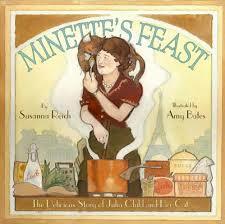 Minette's Feast is not an in-depth biography. Instead, we see Julia's early culinary life in France through the eyes of her tortoiseshell cat, Minette. There is a decent biography in the Afterword of the book, and no quotes in the book were invented. All dialogue came from Julia's books and from Paul and Julia's Child's letters. The book is quite sweet. To see another blogger's recent take on it, please see this post about the book on Amelie's Bookshelf. These all sound like GREAT books! I'm going to check my library for some of these. We do own "Just being Audrey" because, well, we HAD to! We got it for Audrey for Christmas or a birthday a little while back, it is a beautifully done book! Not tired of your women's history posts AT ALL, they are fabulous! I've been taking notes of titles because I would like to share these with my daughter. I have been remiss in my commenting on them but have been thoroughly enjoying them:) Thank for sharing them! Oh, good! I don't mean to sound like I'm begging for comments or something. I've just been pretty focused on them lately, and I'm excited to move on myself! We had a lot of fun reading these, though. We learned so much together. I already have a long list of books I want to check out and (if I'm patient!) post about next March. Wow, I didn't know all of that about Audrey Hepburn! We've read Me, Jane, very cute. This book didn't even go into how as a young girl, she carried secret stuff for the Dutch Resistance in her ballet shoes, before her family went into hiding. Players in Pigtails is one of Lilac's most favorite books! I can't wait 'til she is old enough to see A League of their Own! Of course, at that point she'll probably be totally uninterested...isn't that always the way it goes? Oh, yes, I know. So my 7-year-old is doing this thing where I mention some movie or show or song she loved when she was little and she tells me she can't remember it at all. I think she's doing it to egg me on, though. She has a long memory, and pretends she's forgotten all about some movie she watched over and over again when she was 4. It's so frustrating. So yes, I'll be excited to show her something pertaining to something I thought she loved - I mean, she LOVED it a couple years ago - and she acts like I'm a space alien. Sigh.